Inspired in part by Sonicstate’s top 20 greatest synths and Matrixsynth’s The Most Underrated Synths, here is my alternative. This is my top ten list of synths. Not the greatest by any margin, though there are some classics in there. Not the most historically interesting, though one or two certainly have their place in history. Just 10 synths that I’ve enjoyed using over the years, despite or even because of numerous obstacles they’ve thrown in the way. Most were end-of-line bargains or second-hand gems, but they’ve all served me well. For such a little unit this comes with one of the most comprehensive and awe-inspiring manuals complete with extensive MIDI implentation charts and sysex data. The sound out of this is not great – 4-operator FM is not going to win many prizes these days, or even in the days it was first launched. However it is 8-part multitimbral, which was pretty impressive at its launch, and it does work will for a filler. I usually use it for background layers of choirs, brass or synth strings. Casio didn’t stay in the pro synth market for long, but the CZ series has endured. In theory it is a variant on FM synthesis, but in practice it is much easier to program and tends to sound a bit warmer, with some great synth bass sounds and a nice line in brass blasts. This is the full-sized keyboard version of the very popular CZ101. I don’t use mine very often these days as it is a big keyboard to house for the sake of its 4-note polyphony, but it does get dug out every so often to bring its own charm to the occasional piece. This is a pretty wretched FM workstation with mini-keys, built-in drum pads, sequencer, auto-accompaniment, effects and basic synthesis controls. It is generally pretty weedy sounding, with less oomph than half a FB01 on a bad day, and is really a home keyboard with pretensions of being a synth. However, it is multi-timbral and MIDI-controllable and when the sounds are layered up and a decent drum pattern programmed, it can sound okay. Add some real guitar and vocals and you might just pull it off. This was the first ‘synth’ I had that I could control via MIDI, and it more than doubled the range of sounds I had available at the time. For that I pay it my respect. Akai were several generations of their legendary samplers on by the time I joined the fray with this 3rd-hand bargain. Only 12-bit sample quality, but with all the bells and whistles of the pro favourite S1000, the S950 was quickly pressed into service as an enhancement to the meagre drum sounds of the PSS780, allowing me to mix professionally recorded samples with yobstick, bucket and kalimba samples amongst others, adding more detail to drum parts. I never did manage to get hold of the SCSI disk interface for it, so to this day I have to load it up with several floppy disks, which puts me off using it as much as I might do. What need I say about the DX7. THE classic late 80’s synth. Wonderful electric pianos and bells, wonderful evolving FM washes and great hammered percussion. It is a beast to program, but blessed with a bucketful of computer programs to make it easier, and my first synth was FM-based, so I was in familiar territory. The DX is still my master keyboard for controlling synths, though only occasionally do I use the on-board sounds – usually only for piano or pads. Mine is a mk1, with limited MIDI capabilities, annoyingly curtailed keyboard response and horrible membrane buttons, but it still has a great feel, is built like a tank and is easy to fall back on. My first foray into Sample+Synthesis was with the K4r, the rackmount version of the K4. It took the place of the PSS780 as a general dogbody machine with a good collection of drum kits, 16-part multitimbral sound source and a selection of waveforms suitable for everthing from acoustic guitar to analogue lead synths with a filter section good enough to do it justice. I still use this regularly, and probably still could find new things to do with it. Another 4-operator Yamaha FM synth, but this one’s a little bit special. First of all it has a significantly improved synthesis engine over the old FB01, with a wide range of waveforms to base sounds on. Secondly it has the ability to store micro-tunings for more experimental music. Thirdly it has good support for breath controllers, making it an ideal partner for my Casio digital wind controller (DH100). It also has a range of good software supporting editing, which is just as well since it has a DX7-like unfriendly editing system. Like the DX it is great for metallic sounds and crisp basses. It’s a theremin – does that count as a synth? I say yes. It’s my list. 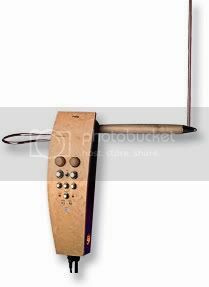 It is the top of the range Moog theremin and a thing of beauty. Curved walnut surface with gleaming chrome knobs. It is has a nice linear playing range, classic preset tones and enough filter and tone controls to provide a wide range of sounds from pure voices to cutting sawtooth buzzes, as well as CV controls for controlling analogue synths like a theremin. It’s my favourite of all the sound creating gadgets I have, but there are two more items that are currently in the lead for historic reasons. This is a tacky little black box with only 5 sounds – electric piano, piano, organ, harpsichord and vibes. I think it uses 12-bit samples – they’re certainly not great quality. It is preset-only with no editing, being designed to plug in and expand a home keyboard. I have used it time and time again, especially the piano and vibes, and it always wins me over with its simplicity. Just select the sound and play. Nothing more to it. It does have pretty good polyphony, or at least good enough for my keyboard playing, and I find the sounds sit comfortably in a mix (though the pipe organ can be a bit overwhelming at times). It really shouldn’t get used as much as it does, but I just can’t help it. Try listening to Yet Another Granfalloon (pt1) for an example of it in action. WHAT? Surely I’m joking? Well, no. I cut my electronic / MIDI / composing / keyboard teeth on this bizarre creature, and for all of its many, MANY faults, it holds a slightly rose-tinted place in my musical heart. When I had the opportunity to buy my first keyboard, some time after The Deserters were formed, I spent endless hours scrutinising music magazines for the best synth for me. I had a few front-runners, including the DX100 and CZ101 which had just come out, though I wasn’t too keen on their small keys. Then the CX5M Music Computer came to the end of its commercial life and dropped significantly in price – I was able to pick up the equivalent in sound quality to a DX9, with in-built computer and sequencer for about the same as a CZ101. I pontificated for a while over this, even passing over the opportunity to pick up a Korg MS10 for 50 quid (ha ha, how very different things could have been had I gone down that route…), but eventually came to the conclusion that it was too good a deal to miss. I wasn’t aware that it couldn’t be played from another MIDI keyboard, despite the presence of a MIDI in socket, so that blew the longevity of it out the water. The only useful sequencer for it at the time was the step sequencer which required some very tedious manual progamming. And the included keyboard was pretty pathetic. However, like so many limited things, these drawbacks just focused the use of the thing, and I soon got my head around FM synthesis using the built-in editor, complex harmonies and rhythms with the score composer sequencer, and drum programming by linking it up to a ZX Spectrum with “SpecDrum” fitted. So it was flawed, but it formed the musical base for a large number of Deserters tunes, try Phill Up the Glass to hear it in action, but most notably the 20-minute-plus instrumental extravaganza that was “Mick’s Amazing Megamix”. Unfortunately the only version of this recorded comes from a badly distorted tape – it has been converted into a more modern sequencer format so may eventually see the light of day using the TX81z to emulate the CX5 tones. So that’s the lot. Not to everyone’s taste, and probably more biased in favour of a certain Japanese manufacturer than I would like, but impoverished gear junkies can’t be choosers.